Explore the cradle of French Canadian civilization on a Québec City vacation, visiting 17th-century cathedrals, walking atop 18th-century city walls and dining on maple syrup pie. Book a Québec City hotel and step back in time. A Montréal vacation means 17th-century French cathedrals, a 20th-century Olympic Park and 21st-century shopping, dining and entertainment. Book a hotel in Montréal to span the centuries in one of Canada’s most exhilarating cities. Sunset cruises along the St. Lawrence River, evening carriage rides and strolling by starlight along 18th-century city ramparts are just a few of the top 10 romantic things to do in Québec City. Book a Québec City hotel and plan a weekend to remember. Biking the shady paths of Park Mont-Royal, sipping wine on sunny terraces and dining by candlelight in Old Montréal are just a few of the top 10 romantic things to do in Montréal. Book a hotel in Montréal and treat your sweetheart to an unforgettable holiday. Enjoy winter vacations in Québec City, where streetlamps glow under a blanket of snow, couples warm up over mulled wine, and visitors play and dance at the world’s biggest winter carnival. Book a winter hotel in Québec City for a magical winter getaway. Even a short getaway in Québec City offers enough time to be charmed by its old-world elegance. Book a Québec City hotel and lose yourself in 18th-century French Canada. Plan a summer vacation in Montréal and enjoy coffee breaks at sidewalk cafés, starlit strolls along cobblestone streets and a season full of festivals. Book a summer hotel in Montréal and celebrate the season. Discover historic French Canada and lively bistros on a short getaway in Montréal. Book a Montréal hotel and see the best of the city following this inspiring itinerary. Whether you’re planning a family getaway or a romantic weekend, choosing where to stay in Québec City is the key to stress-free travel. Use this helpful guide and find the Québec City hotel you’re looking for. Whether you’re looking for a romantic Old Montréal hotel or modern lodging with all the business amenities, follow this guide and choose where to stay in Montréal. The lavishly historic city of Quebec is often considered to be the oldest in Canada, and it certainly feels like a portal through time thanks to the charming cobbled streets and 17th century architecture. As the capital of the Quebec region, there's a lively cultural scene, and at night the theaters and concert halls come alive with world-class live performances. Whether you want a serene city break with museums and walking tours, or a quirkily fun family trip, there are many sides to Quebec City to explore. With ornate cathedrals and a Parisian flavor to the streets, Montreal cherry picks the best of Europe and Canada to create an entirely unique identity. Consistently named as one of the world’s best places to live, forward-thinking Montreal is a serene city break destination, with rich history and fine museums, not to mention stimulating festivals to get stuck into. Quebec has a refreshingly laid back nightlife scene, with a few exclusive clubs, and lots of cool but casual bars. After dark, the cultural scene also becomes livelier, with independent movie screenings, live music, and cozy spots such as traditional pubs for drinks and chatter. 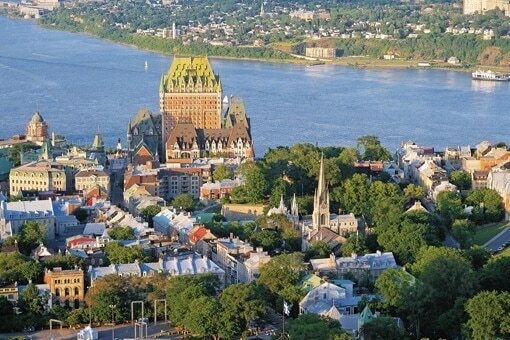 Safe, clean, and fairy tale like in its historic center, the city of Quebec is the perfect place to bring children, and most attractions have something to offer for younger visitors. They'll love the maze-like cobblestone streets and vast outdoor spaces, and there’s even a museum dedicated to chocolate. Who could resist? You can’t visit Quebec and neglect the historic core – bring your comfiest walking shoes, because you’ll want to explore every ornate nook and cranny here. Drink, laugh and dance, as you discover some of Canada's best nightlife on the glowing streets of Montreal. You can chuckle through the start of your evening at one of this comedy capital’s bars, before ending it in a thumping dance club or a cozy drinking hole where rows of unique craft beers all beg to be sampled. Let the family fun flow as you work together to battle the rapids of the St. Lawrence River, before spotting whales in its yawning waters, or meeting playful penguins in the city’s zoos. Top sporting action, and fantastic food for the fussiest eaters, makes Montreal an unbeatable family vacation destination. Montreal isn’t just packed with cultural highlights – the city is a creative powerhouse, which explains why it was awarded prestigious UNESCO City of Design recognition. With massive festivals bringing the city together on a regular basis, and a wealth of venues for live performances, Montreal’s arts scene will stimulate anyone looking for avant-garde distractions.